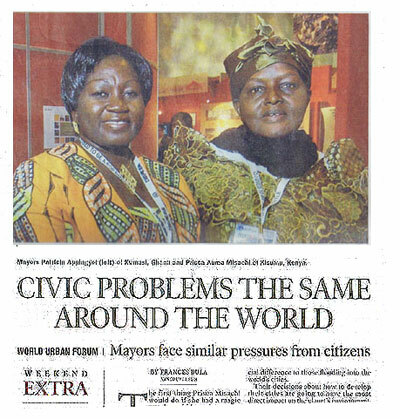 Article appeared on Saturday after the close of UN World Urban Forum 3. Mayor Patricia Applagyei (left) of Kumasi, Ghana, one of the mayors our editors had the privilege of touring during and following the forum in Vancouver, Canada..
"Patricia Appiagyei, the Mayor of Kumasi, the second-largest city in Ghana with 1.5 million people, is also struggling with garbage, but her problem is how to develop a system of charging a small fee to each household so the city can introduce individual pickup - a daunting task when half your city consists of slums that have no streets or house numbers. Abdelkader Sidibe, the mayor of Bomako in Benin, is trying to develop a school system with only 50 kids per gh classroom instead of the current 150-200. The forum brought together an unprecedented number of mayors - about 100 of them - and several sessions focused on city governments.". 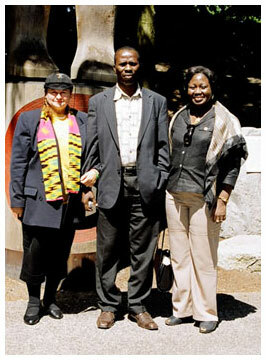 Right: Mayor Patricia Applagyei (right) of Kumasi, Ghana's second largest city with Africa Travel Magazine's Muguette Goufrani and Hon..David Quay Annang, Municipal Chief Executive of Tema.of Tema, Ghana.